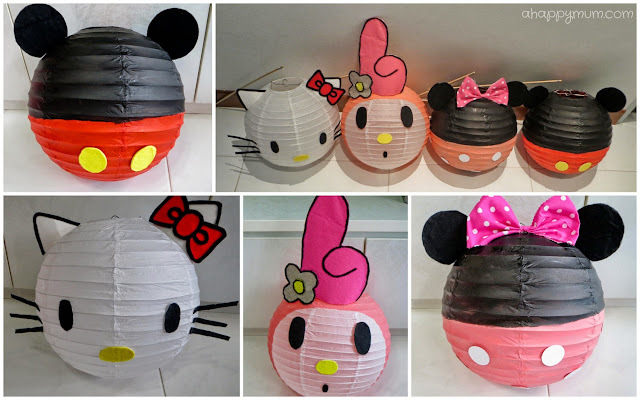 Creativity 521 #30 - Mummy, can I have a Hello Kitty lantern? It all began when we were out shopping at White Sands one day. We were browsing through stuff in Popular bookstore when I remembered that Mid-Autumn Festival was approaching. Me: Shall we go and buy a couple of lanterns for the kids later? 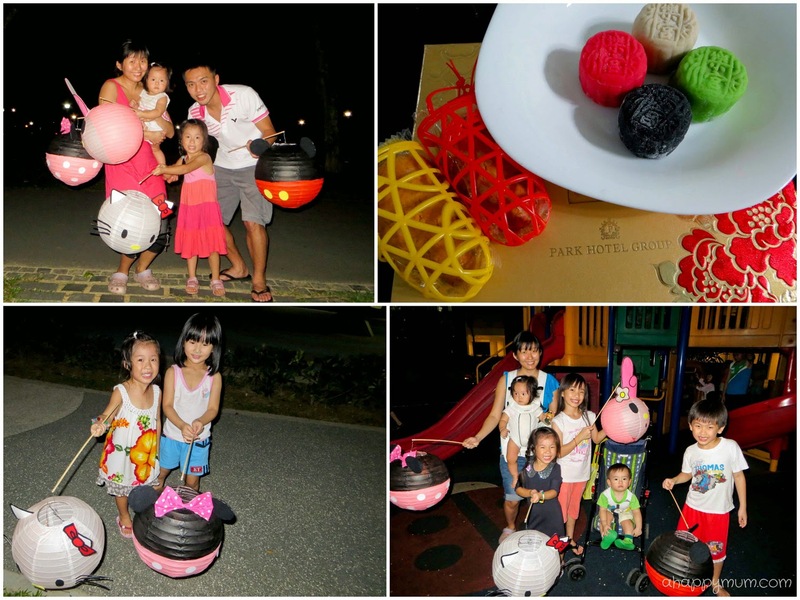 Angel: Mummy, I want a Hello Kitty lantern! Can, can? Well, that was a challenge from the hubby I couldn't reject and a plead from my child that I could only say "Yes" to. Feebly. Turned out that after some brainstorming, online research and a little hunt for the materials, it wasn't that hard a task after all and we had fun creating not one, but four lanterns for the family. Other than the paper lanterns, we actually found all the other materials in our house. Ah huh. Can you imagine all the hills and mountains of stuff I have stashed away? My first lantern was of course going to be Hello Kitty since you have to agree with me that it is actually one of the easiest characters to draw, right? Using a printout as my visual guide, I drew out the facial features of the cat, which would be more or less the right size for the lantern, on a piece of cardboard and cut them out. Next, I stuck them onto felt cloth of different colours using glue and cut these out too. The ribbon was the most challenging one to draw, cut and outline but I thought the black outline gave it a nice definition and three-dimensional look too. After that, it was time to open up the lantern with care and insert the metal support provided. Using double sided tape, I secured the parts of Hello Kitty onto the lantern and once I was satisfied with the whole look, I used glue to stick them in place so that the cat would not be missing an eye or a whisker (I mean, it already has no mouth, right) after being swung or flung around by the excited kid. Moving on the the lantern for baby Ariel which is the My Melody lantern since the elder sis has helped to decide that the younger one wants a rabbit lantern, we basically did the same steps except that we also painted the lantern where it was supposed to be pink. Make sure you use acrylic paint, which is fast drying and water resistant when dry, and do not wet the lantern with too much water in case it breaks. You can also choose to paint the black outline instead of using felt, which was what I did for My Melody because the ears were an odd shape and would have taken me ages to cut out the felt. 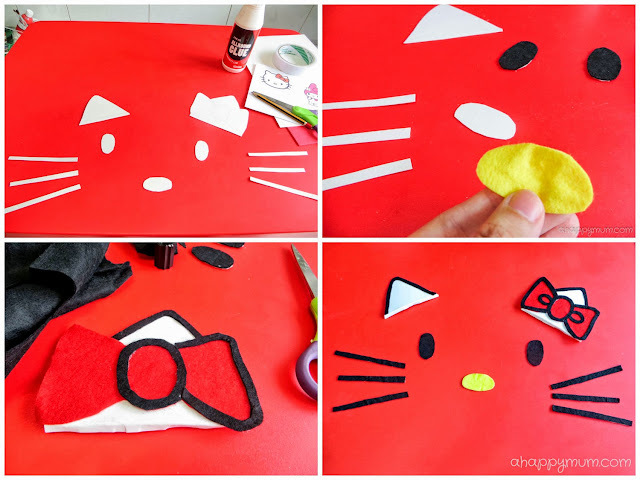 Tip #1: To stick on the ears of Hello Kitty and My Melody, leave a flap of cardboard when you cut out the shape. Fold this flap backwards and stick it on using glue. You can also bend the ears a little to fit the contour of the lantern. If you find it difficult to stick down the flap, make two slits in between, overlap and adjust accordingly and this will help the ears stay in place. We decided to make two more simple lanterns, which Angel said were for Daddy and Mummy, and who else did I think of but Mickey and Minnie - simply because we did this theme for Angel's 2nd birthday (read on how we made Mickey/Minnie mouse ears as party favours too) and I had plenty of ribbons, cloth and supplies lying around. 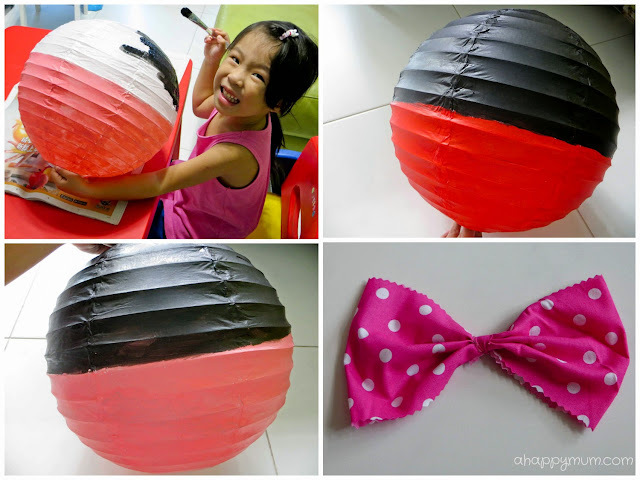 For the lanterns, we painted half black and half red for Mickey and attached two yellow buttons at the bottom. Then, we painted black and pink for Minnie, and cut out small white circles to form her polka dots. Since Minnie is never without her bow, I cut out a huge strip of cloth with pinking shears, made accordion folds and tied with a small strip in the middle. To secure it onto the lantern, apply glue in the centre portion, press down firmly and allow it to dry. As for the ears, I cut out two circles from the cardboard for each ear, stuck these together and covered the front and back with black felt by gluing. To attach to the lantern, simply fold a small flap backwards, position the ears symmetrically on the lantern and stick down with glue. It may be a personal preference but I like my lanterns to have candles instead of being battery operated and blast music at the touch of a switch. Yes, I'm traditional that way and I think carrying lanterns is all about seeing your lighted candle, taking time to admire it and stopping to relight or insert another candle when the flame goes out. So, since these lanterns came without a candle holder, I had to DIY my own out of a thin wire. 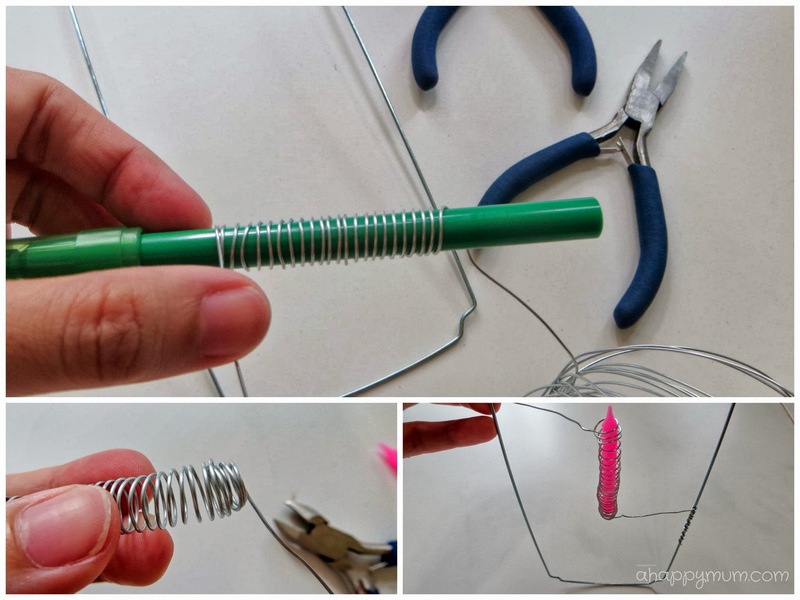 Using a suitable size pen, twirl the wire around it to form a coil, closing it at the end by pulling tighter after you remove the pen. Secure it to the two sides of the metal support, using a pliers to flatten the sharp ends. Tip #2: Use only 3-4 loops to secure the candle at its bottom end only. If you use too much wire like what we did initially, the flame will burn the metal instead and result in a dim light. 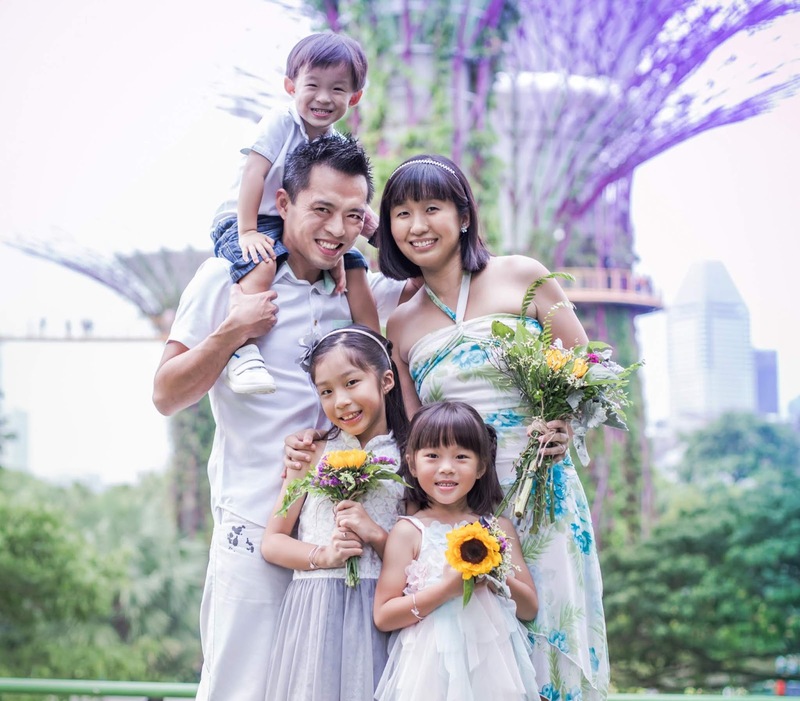 Tip #3: Since these lanterns cannot be 'closed' anymore, it becomes a little challenging to light the candles. If you are up to the challenge and have small hands like the hubby, it will not be a problem and one technique is to tilt the lantern sideways when lighting so that you will not burn your fingers. Otherwise, do consider using a stick and tie a candle at one end, using this to help you light the candle in the lantern instead. Voila! These were how our lanterns looked in the end and we were all set for Mid-Autumn Festival 2013! Which is your personal favourite? You know, the great thing about plain lanterns is that with some creativity and imagination, you can turn it into any character that you like! 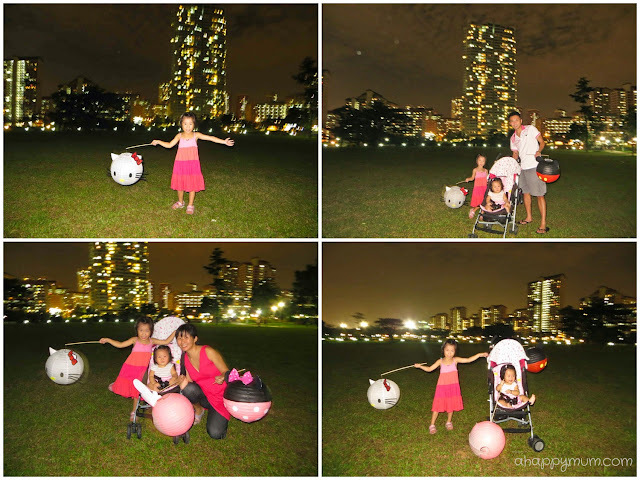 We went for our first lantern-carrying night walk at Bishan Park, which totally thrilled the girl and she even made up and sang her own lantern song, which was amusing and endearing at the same time. The hubby and I had our doubts about these handmade lanterns and we half suspected they would start to burn anytime, therefore we even taught Angel to "Drop and run!" if the lanterns were to catch fire. Which, by the way, totally shocked and saddened her. Thankfully, these lanterns proved to be stronger than we imagined and they actually survived one entire week of lantern carrying fun. Mooncakes, piglet biscuits, lanterns, friends, family. 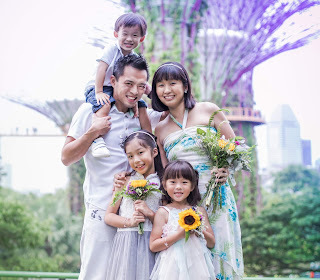 To me, these are what Mid-Autumn is all about. I doubt there was any better way we could have spent this festival after being away from home for so many years and missing the feeling of gathering with loved ones. By the way, we did carry lanterns in Karlskrona too but people would look at us like we were from another planet. In any case, I am just glad to have made Angel's lantern dream come true and I hope all of you had a great Mid-Autumn festival too! Thanks, yeah I hope they had a great time too though in the end they were more keen on playing at the playground than carrying lanterns! Haha, expected. Have a safe trip back! The black outline was a nice touch! Love how you managed to make different characters from the same lantern! Thanks Jus! Yeah the black outline made all the difference. =) Yes I love how plain lanterns allow you to be creative too! Really nice lanterns you have there! And you are indeed very creative! Gonna try that next year. But for now, I need to find these plain lantern for a ocean theme birthday party. Can I know which stationary shop you got those from? Hopefully they are not only for sale during festival. Hello, I got them at a stationery shop in Rivervale Mall in Sengkang. 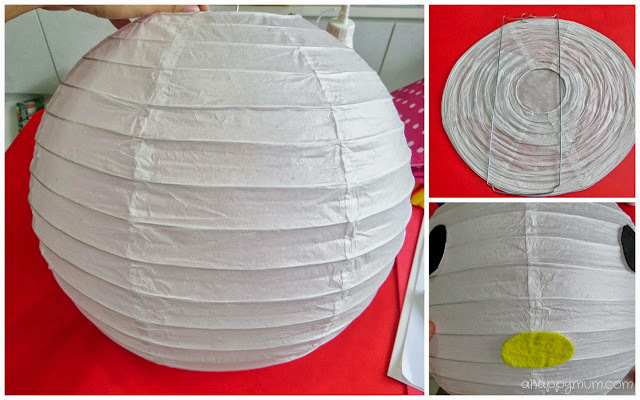 These are plain, round paper lanterns so hopefully u can find them in other neighbourhood stores too. Good luck and have fun!Mall in Sengkang. These are plain, round paper lanterns so hopefully u can find them in other neighbourhood stores too. Good luck and have fun!